I woke up, twisted my head and thought, why not? 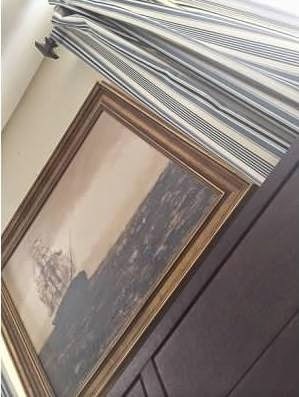 My headboard, bedroom drapes, and the etching above our bed. I tend to be very pleased with the combination of these three things. Perhaps one day I'll actually take a real photo of them. I spent most of today at a medical imaging facility, trying to figure out what's causing me pain in my lower right abdomen. So far it looks like nothing to be too concerned about. Not precisely the most fun way to spend a Friday, however. I think my daughter is developing swimmer's ear. At the least, she's got some water in her ear that needs to be removed. She's gone swimming almost every day this summer and it's nearly August, and she had an ear incident last year. I think this is going to be something that we deal with her more times, in more summers, after more swim sessions. Both the twins have delighted in coming home to share the grade school level potty humor they've picked up in camp. We're being asked to spell "I CUP" and to answer what we were eating under there. "Under where?" Hysterical laughter. Get it? Under where? Underwear? Yeah, eyeroll. This afternoon I actually found myself explaining to the dog that I don't speak dog. As if she speaks English. So there you go. I hope you and your daughter are feeling better. Cheers to pain-free weekend.